This bridge appears to have collapsed – there’s a YouTube video showing the collapse of an ice bridge on 10 March 2016. In that respect it bears some resemblance to the Azure Window limestone arch off the western coast of Gozo, which starred in many films before its collapse on 8 March 2017, almost exactly a year after the Perito Moreno bridge. However, unlike the Azure Window, there’s every chance that another ice bridge will be here again soon. The Southern Patagonian ice field is the third largest glacier in the world after the polar ice caps and, unlike them, is growing. 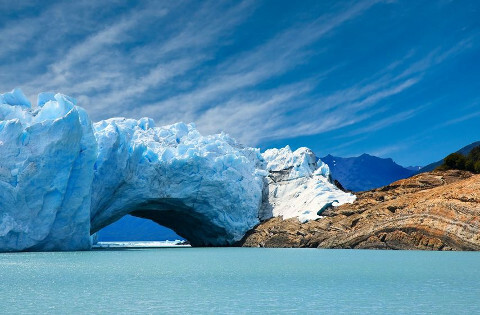 The Perito Moreno bridge forms frequently (roughly every four years) and could be expected to have grown again by 2020. This entry was posted	on Saturday 30 March 2019 at 15:20	and is filed under 2019, Argentina, British Expat Latest. You can follow any responses to this entry through the RSS 2.0 feed. You can leave a response, or trackback from your own site.